Actually, speaking of low stakes cash games, there is another factor that players struggle with. Just as with limping, this option named the “straddle” affects the action in certain hands. If you are not familiar with how straddle affects your play, for sure this link needs your attention. Let us start with explaining what limping in poker means and what it says about the player who has decided to take this action. When a player just calls the amount of the big blind, we call this action “a limp” and the player- “a limper“. It is generally considered a weak play. First of all, just limping means that he will face the flop at least playing against the big blind. In other words, the player doesn’t have the option to win the pot preflop without having to fight and see a flop. Not to mention the situations when other players will also just call the blind and the limper will have to play post-flop multiway out of position. Another tough situation will arise when a player raises behind him. The limper will need to often fold or call with hands that were not good enough to play in the first place! Although ‘open-limping’ is not suggested, “over-limping” can be a good option. In fact, we have just three options here- to fold, to over-limp (to call one big blind behind the limper) or to raise. Which play to choose is a complex decision. We have to take into account a lot of factors such as our position; are we facing just one limper or has someone else already over-limped; how likely it is someone behind will call and how likely are they to raise; if one player does raise how many of the limpers will likely call. Now you see why we need to build a solid strategy versus limpers. As a general rule, we over-limp hands that are not strong enough to raise but at the same time are playable and profitable to over-limp. 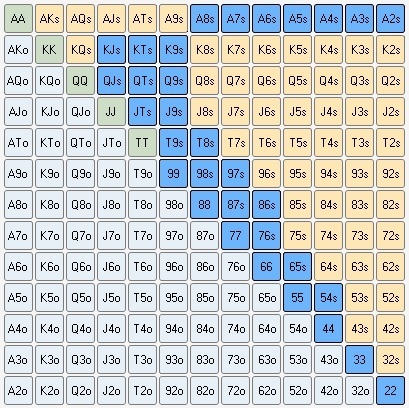 An example of such hands would be low pocket pairs, low suited aces, low suited connectors and low suited gappers. We do not over-limp off-suited hands because we miss the chances to flop a flush or flush-draw. Pocket pairs from 22 to 88 (sometimes 99) are good to be over-limped. Talking of low suited aces to just call, this would be A2s to A8s. The low suited connectors and gappers to over-limp are such as KJs, KTs, K9s, QJs, QTs, Q9s, JTs, J9s, T9s, T8s, 98s, 97s, 87s, 86s, 76s, 65s, 54s and sometimes even 43s. Here is a chart to help you visualise the range. The position from which we are playing is also very important. To be aware of the position you play hands is actually one of the top tips for players who just start with the game of poker. We are more likely to over-limp from the late positions because we have fewer players behind who have the option to raise and put us in uncomfortable situations. For example, if we are in MP1 with 97s the right play is to simply fold. If we over-limp with this hand from this position there are too many players behind. This increases the possibility of a raise and we have to fold eventually anyway. The same hand, 97s, dealt to us on the button and facing one limper, is a good candidate for over-limp because we have just two players behind and we will play in position post- flop. Some hands in our range will be strong enough to raise with even after a limper or multiple limpers. Such hands would be strong pairs like 99+, ATs+, AJo+, KQs, KQo and sometimes even 89s to give us some board coverage. As a general rule, the more the limpers- the stronger the raise range and the bigger the sizing. For example, we can raise 88 from the HJ against one limper but we will be more likely to over-limp against two or more limpers. Pocket 99 or a hand like ATs are strong enough to be raised against even two limpers without a second thought. You have to keep in mind that a player who has limped or over-limped will nearly always be calling an isolation raise. That is why we need to have a strong range to raise with and to choose our sizing wisely. We can choose bigger sizings with our AA, KK, QQ type of hands but lower if we were dealt AJo for example. Speaking of sizing, what is a reasonable one? The answer is- it depends. If you play cash games where the stacks are usually deep, you can raise five times the big blind and add one big blind for every limper already in play. Let us say you play $1/$2 cash and you have a hand for a raise after two limpers. Your size would be 5x$2 + 2x$2 = $14. In tournaments though, the sizing depends on the effective stack on the table. If you are deep stacked, meaning you have 50+ big blinds stacks, the raise size could be three times the big blind plus one big blind per every limper. If your stacks are around 30-40 big blinds, a raise like two and a half times the big blind plus one blind per limper would be more suitable. Again, your hand is also important. 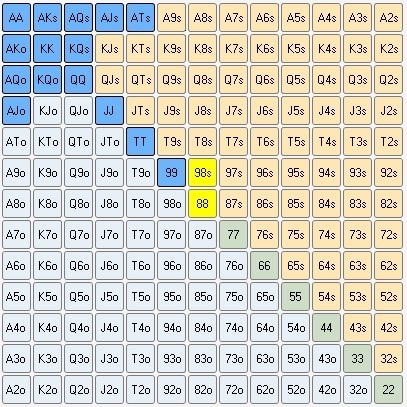 You can raise 3x+1 with 35 big blinds stack if you have AA, KK, QQ, JJ, AKs, AQs, AKo. Another thing to consider is when playing lower stakes it is not so crucially important to be balanced because your opponents won’t be taking as much notice of your ranges. Meaning you can make bigger raises with your premium hands and smaller raises with the rest of your range and not be worried that the other players will accordingly adjust their play. Knowing how to respond against limpers is an important skill to develop. Also, building a solid preflop understanding of the various techniques is crucial to improving at Texas Hold Em. Poker as a game is very dynamic and the final decision always depends on various different factors. We hope this article gave you a solid starting base when it comes to dealing with limpers and helped you adjust your range to crush these types of opponents.